Ticks like to hang out on the tips of shrubs and bushes waiting for a mammal to come along so they can hitch a ride and have lunch. Did you know that a deer tick the size of the tip of your pen could potentially cause Lyme Disease? 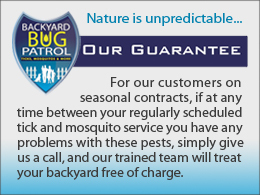 My entire family was diagnosed with Lyme Disease a few years back, that’s why we started Backyard Bug Patrol. I don’t take ticks lightly. Backyard Bug Patrol can help protect your family and pets from these pests. 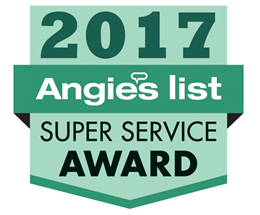 With the purchase of one of our tick control packages, our licensed applicators will come to your home and barrier spray your yard. Our programs below not only knock these pests dead on contact but our backpack sprayers get deep into the foliage in your yard and coat leaves and bushes leaving a protective barrier that repels these pests. 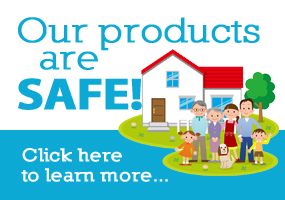 Our company offers two basic barrier spray services to protect your family from ticks, mosquitos and more. Tick Tunnels are a must for a complete tick control plan! While Backyard Bug Patrol’s barrier sprays effectively kill ticks on contact and provide invisible protection that last up to three weeks, no tick reduction/eradication program is complete without adding Tick Tunnels. These tubes kill deer ticks! Tick Tunnels are recycled, biodegradable tubes stuffed with cotton balls that have been treated with our tick killing solution. Our licensed tech will strategically place Tick Tunnels that kill deer ticks around your yard in all the locations where mice and other rodents frequent, making every effort to hide them. Sometimes our techs do such a great job hiding them you might not actually be able to see them. Tick Tunnels are designed so that the white footed mouse and other rodents enter the tube and take the cotton balls back to their den. 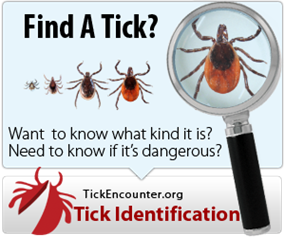 Here’s why that’s important; Most people think that since the tick that carries Lyme Disease is called a deer tick, that these ticks gets Lyme disease from deer. Not true. Deer are one of the few animals that are actually immune to Lyme. Deer are just an easy target for the ticks. Each deer can have up to 1000 ticks on it and each female can lay up to 18,000 eggs. When you do the math that’s a lot of ticks in your yard. And, deer ticks can be found on all animals, including squirrels and birds too. So if you have any type of animals roaming your yard you likely have deer ticks. 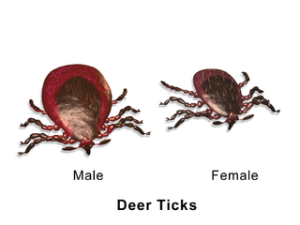 The life cycle of the deer tick is about two years. In one of the phases of their life cycle, they live with the white footed mouse and other rodents. The treated cotton balls in our Tick Tunnels will kill the deer ticks in the den but not hurt the mouse or other rodent. It’s interesting to note that up to 90% of the cases of Lyme disease are not caused by adult deer ticks that we’ve all seen and pulled off our kids and pets, but rather the nymph tick. The nymph is the size of the tip of a pen or a poppy seed. If it gets in your child’s hair or on your dog, how can you see it? The white footed mouse gets Lyme disease one of two ways. They either get it from their parent, which means they are born with it, or they get it from the white footed mouse. Barrier spray treatments and Tick Tunnels effectively help to break the life cycle of deer ticks in and around your yard. In some experiments, similarly treated cotton balls in tick-killing tubes have proven to be effective in reducing ticks that can cause Lyme disease by up to 10 times. When you purchase Tick tunnels as part of your backyard tick control and management plan we provide two treatments, we will place our Tick Tunnels in the spring or summer and once again in the fall. Contact us for more information.